As the sun was ascending its blazing course through the blue sky on a hot Sunday morning, I was busy thinking about the tasks I had to accomplish and my schedule for the day. Happening to look upwards by chance to watch a jet leaving its trail behind, I witnessed a rather unusual sight. 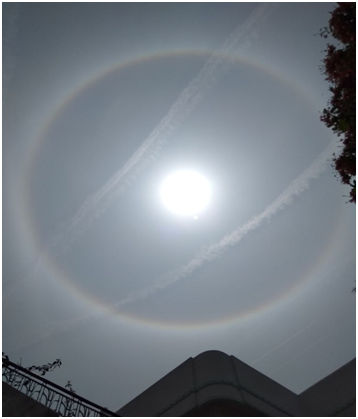 At about 11:00 am IST, I found a perfectly circular spectrum of light encircling the sun! This was a first for me, by all means; much as I have seen rainbows gracing rain-laden evening skies in the monsoon season. But this spectacular, prismatic colored ring was unique for me. This uncommon meteorological event was missed by a majority of Lucknowites who were either seeking refuge from the hot summer sun by reclining in their air-conditioned drawing rooms, or busy chatting or texting on their phones, watching television, or still sleeping after partying hard till the wee hours of Sunday morning! As for myself, it was a most significant diversion from spending a mundane, drab and rather listless Sunday; a major chunk of which goes in preparation for the upcoming week. My Sundays are always other than being relaxed or chilled. This spectacular event rejuvenated me and helped me set the mood and tone for the day. My excitement knew no bounds as I finally got to witness a complete circular rainbow. More so, I was happy to think that it meant my city would be receiving some rain in the coming week to tone down the soaring and searing temperatures (which Lucknow eventually did in the form of thundershowers!). Rainbows have always fascinated me since childhood. I have always found the myths and folklore surrounding them so interesting as well as intriguing. I remember how as a child my mother always told me that ‘a rainbow is the stairway to heaven’ and listening ever-so-dreamily to my all time favorite Led Zeppelin song ‘Stairway to Heaven’. These reflections finally gave way to my research instinct. Coming out of my reverie, I searched the net for a history of similar sightings in the past. I came across a news item about a similar optical phenomenon witnessed in Kolkata in April, 2016. Rainbow halos are relatively more common in the west, particularly in the US because of the altitude. Prismatic halos around the sun occur due to the presence of moisture in the air which leads to formation of thin cirrus clouds. The tiny ice crystals and raindrops in the clouds act as ‘mini prisms’ leading to refraction and splitting of sun’s light into its constituent colors. However, the tiny ice crystals need to be inclined at an angle of 22° for the halo to be seen around the sun which is not always the case. So, here’s waiting the next time for the halo to form! About the Author: The writer is Assistant Professor, Dept. of Biochemistry, Era’s Lucknow Medical College, Era University, Lucknow, UP. Her research interests include non-invasive methods of cancer prevention, alleviation and treatment. She is an avid reader and her free time activities include gardening, listening to music and bird watching.